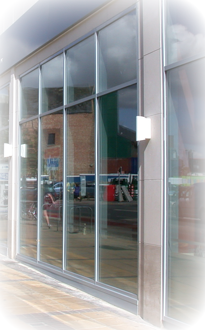 The Commercial Group are specialists in the manufacture, supply and installation of commercial aluminium shop fronts. We are the leading provider of aluminium shop fronts to the UK shop fitting industry where our fabrication skills are highly respected and the quality of our product is very high. Standard ground floor framing, curtain walling or aluminium windows and doors are fabricated to exact design specifications with installation anywhere throughout the UK. In addition to new projects, entrances can be cost effectively upgraded to provide safe and easy access. This is especially relevant where a company needs to comply with the Disability Discrimination Act. Many solutions are possible, either by automating an existing door or installing a complete new access solution with sliding, hinged or folding doors. As part of our standard service we action the rapid replacement of partially or completely damaged shop fronts as a result of a ram raid or similar attack. A skilled operative conducts a detailed survey to assess the correct specification and materials required to ensure the speedy manufacture and installation of the repaired or replacement shop front. Usually, fully glazed standard aluminium shop fronts are installed within a few days, however specialist finishes can take longer. We hold in stock aluminium section ready painted in corporate colours for those customers requiring an even faster response. Commercial Aluminium have installed shop fronts to many retail and industrial premises across the United Kingdom and are a trusted name for quality, speed and accuracy. We can help your company and we offer a free, no obligation chat where we can solve your shop front problem quickly and efficiently. 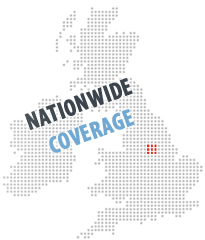 We can provide examples of our work and can fit even the trickiest frontages with our many years of experience.